To meet the various requirements of the customers, we are involved in offering a wide assortment of Non Woven D Cut Carry Bag. D-cut Bag is made out of pp spun bonded non woven fabric. 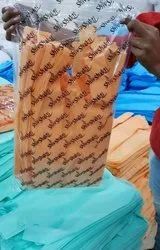 non woven d-cut bag is very use full product solution now a days as plastic bag are not recyclable and cause environment problems, instead of that non woven d-cut bag are recyclable and environment friendly. To satisfy the varying requirements of customers, our company is offering an extensive range of Non Woven D Cut Bag. 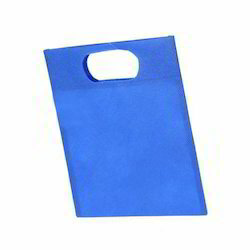 Available in various sizes and colors, our Non Woven D Cut Bag is widely demanded. The Non Woven D Cut Bag of our company is known for their best quality and can carry various loads according to its capacity. Balaji Polytex Industry Pvt. Ltd.
Non-Woven D Cut bags are easy to carry. Non-Woven D Cut are multipurpose bags, various thickness range available from 30 gsm to 80 gsm Non-Woven D Cut have Eye catching color like red, green, blue, white, yellow, orange, black and many more. Various sizes also available. Eco friendly bags.